We’re super excited to be joining up with the folks from Detour Magazine for their Launch Part this Thursday, Friday and Saturday at the Magic Stick and CAID. 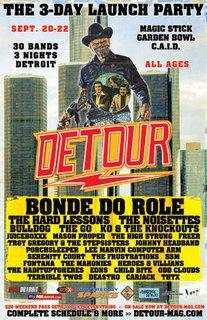 Lots of great rock planned for this weekend to celebrate Detroit’s newest pop culture site. Each night of the party, join Handmade Detroit in the Magic Stick. We’ll be previewing our Handmade Detroit Holiday Market as well as setting up different crafty vendors every night. Swing by and say hello. On Saturday, you can get your craft on at the Loop Make and Take Table from noon to 8 p.m. @ the CAID. They are making shrinky dink mix tape pins!